Remember, the goal of Blackjack is not to get as close to 21, but to beat the dealer and win as much money as possible. 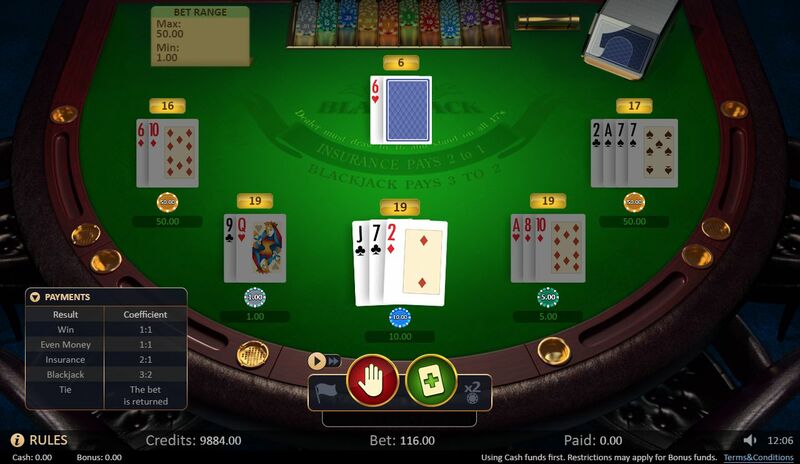 According to the Classic Blackjack Game Rules, the game's objective is to gain a hand value higher than the dealer’s is, without exceeding 21 points. The spot cards (from 2 to 10) are counted as face value. The value of Ace is counted either as 1 or 11. Kings, Queens and Jacks are valued as 10. A player is dealt two cards face up. A dealer is dealt one face up card. When the cards are dealt, the player may choose one of available options depending on the value of cards he received. Player stands automatically when total value of the hand is 21. When a player’s hand value goes above 21 (busted), the hand loses. If the first two cards dealt to the player have the total value of 21, player has a Blackjack. If a player and a dealer have equal cards, it is a tie and the bet is returned. The (Min/Max) define the minimum and the maximum limits for the initial bet. When the player takes an additional card and the hand’s value exceeds 21, the round is over and player losses the round. Dealer receives additional cards only after the player has made the decision concerning his hand or hands. The cards will be dealt to the dealer automatically until his hand’s value will be at least 17. In case the dealer hand’s value exceeds 21, his hand is considered a bust. When all cards are dealt and the dealer’s hand is higher than the player’s is, and do not exceed 21 - the player loses his bet. If the player’s hand is higher than the dealer's, the payout is 1:1. If a player has a Blackjack, his hand is paid 3:2. If the player and the dealer have equal hands, the round is finished and the bets are returned.